Composed by Robert Schumann. Choral Works (inc. Oratorios). Op. 29, No.2; Op.69, 91, 114 [SSA,Pf(4)]; SSAA (Pf ad lib)(10); SSAA (Pf ad lib)(1); SSSAAA a cappella(1) - (Text Language: German). Choral. Vocal Score. 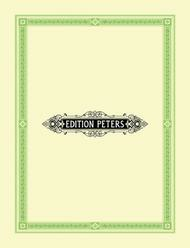 Edition Peters #EP2393. Published by Edition Peters (PE.EP2393).